第2-11章：第五个披头士 - The Fifth Beatle, By George! Above: Some items from my Beatles collection. The Fifth Beatle, By George! In 1983, Russell and I were spending a lot of time in Los Angeles. If we weren't at the Westwood Marquis, we were staying at Don Arden's house in Beverly Hills. At that time, Don was our manager and had two bungalows adjoining his house. Russell and I each stayed in one for quite some time. It was extremely convenient, as we were doing a lot of TV shows, both in Los Angeles and New York. It was also very comfortable, private and, since Don had a gatekeeper 24 hours a day, safe. I think the security was for Don, not us, as he had a reputation for being a tough cookie. We arrived on time, as we always did, at a restaurant on Sunset in Hollywood, and George arrived at the same time. We were introduced and surprised that George knew our names already as well as a lot our songs. Laura was there, too, but she quickly said, "I'm going to leave you guys alone for a while," and left us at the table with instructions to call her when we were finished. George made us feel so comfortable straightaway, and we talked about his hometown, his family, his cars, the Queen of England, just about everything but the Beatles, which, of course, we were dying to ask about. We just felt awkward asking, as surely everyone did that already. We had our lunch and never stopped talking. I kept saying to myself the whole time that we were having lunch with George Martin - it was surreal! I made a special effort to eat correctly and not put my elbows on the table, as I had been taught. My parents would have been proud. After two hours, we were still talking away and the check came. The time flew by. George picked up the check, but I can't remember who paid it in the end. I thought to myself, "Wow, I left it too late, being so polite." Then George asks Russell and me, "Aren't you going to asked me about the Beatles?" Of course, that was it. 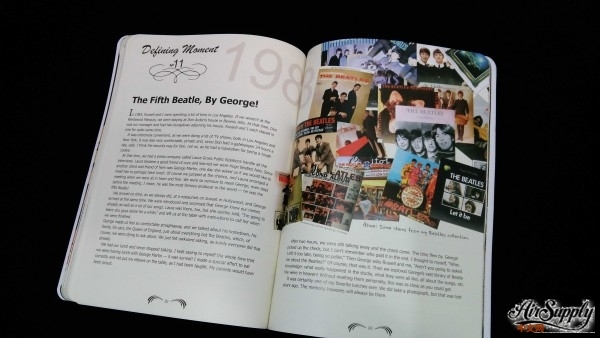 Then we explored George's vast library of Beatle knowledge: what really happened in the studio, what they were all like, all about the songs, etc. We were in heaven! Without meeting them personally, this was as close as you could get. It was certainly one of my favorite lunches ever. We did take a photograph, but that was lost years ago. The memory, however, will always be there.